I’ve got a couple New Year’s resolutions… for safety purposes. Below I will offer 5 reasons NOT to carry a gun with an empty chamber. First, I’m going to make sure my car doesn’t have any gas in it until I need to use it. Heck, gas gets old and stanky and we all know it can explode if something weird and unexpected happens. I figure if something urgent comes up, like my wife going into labor, I can just fill it up real quick-like and boogey on down to the hospital. No problem. Concurrent with my gas-on-demand plan, I’m going to adopt the same winning strategy with the fire extinguisher in my kitchen. We all know flame retardant can make a real mess if it goes off accidentally and I ain’t got time for cleaning up that junk in my house. I’m just going to load up my extinguisher with flame-putter-outter powder if and when I need to use it to quench out an out-of-control Wok-full of General Tso’s Chicken. So, what do you think? Am I on to something big here? I suppose the same “load on demand” strategy could apply to self-defense guns too – You know, tote your concealed carry pistol around with an empty chamber. If you ever need to use your gun in self defense, you can always just rack the slide to chamber a round, right? The only problem with that plan is that a load-when-you-need-it approach just might get you killed. 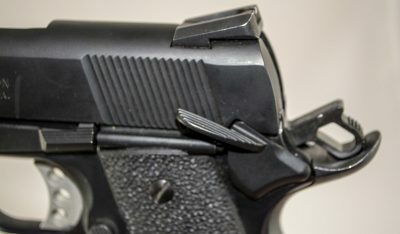 The de-cocker / safety lever on this Beretta 92 FS Compact is an additional layer of “safety” for carrying a chambered round. Actually, the odds of that strategy getting you killed are higher than “just might.” Just ask the family of the late Heriberto Aceves and his son Juan. Armed robbers confronted the pair in their convenience store and demanded money, pistol whipping them in the process. Aceves found an opportunity to draw his gun in self-defense. However, there was no bullet chambered in Aceves’ pistol, and while he was racking the slide to put one there, he was shot by at least one of the robbers. Falling to the ground, he continued to try to get a round into his gun while mortally wounded. Aceves and his son were both killed before the robbers fled the scene. Here are five reasons you should always keep a concealed carry gun in the “round chambered condition” assuming of course, that it was designed to operate that way. It should go without saying that all safeties (where applicable) should be engaged according the gun’s design. Just to be clear, we’re talking about empty chambers, not disabling or disengaging safety devices. With practice, you can operate the slide of a semi-automatic pistol in tenths of a second. That sounds pretty good on paper, right? You may think, “Hey, if I get attacked, it’ll only take me a jiffy to rack that slide so I can shoot back.” Stop and think about this for a second. The critical part of a violent encounter may only last a second or two. The time required to rack the slide and load a round is way too much to willingly give your attacker in a struggle with life and death consequences. Why on earth would you want to react to a violent attack starting at such a time disadvantage? Your attacker can do a whole host of bad things in those tenths of seconds when you’re racking the slide. The bad guy in a confrontation is the actor who does the initial acting. You’re not the one deciding when the festivities start. In fact, you’re almost always going to be in the unenviable position of reacting to the bad guy’s acting, so you’re behind the power curve from the get go. Way behind. This concept cuts to the very core of defensive shooting. You are defending against an offensive action that you didn’t plan or start. As a defender, you can’t (by definition) do anything until your brain receives input from the aggressor’s action, determines it’s a bad and dangerous thing, contemplates a response, and issues commands to the body to take action. All of this takes time, during which your attacker is executing whatever actions he planned earlier. See how you’re behind the curve? Even pistols with no manual safety, like this Glock, are safe to carry with a round chambered. Your local police do exactly that. While numbers vary, reacting to something – anything – takes a human some number of tenths of a second. Being that far behind why would you want to add more tenths of seconds to your response time? In the case study referenced above, Heriberto Aceves was literally shot while he was racking the slide of his pistol. If he hadn’t needed to do that, he still might have been shot, but he also would have put some hurt on his attacker, improving his odds of survival immensely because he might have stopped continuing shooting from the bad guy. Or, in the best case, he might have gotten his shot off first, changing the entire outcome of the event. If you need to bring your gun into action at high speed in response to a violent attack, and you need to rack the slide to do so, you’re going to need both hands. That’s the normal way to do it. Sure, there are ways to rack a slide with one hand, but they’re slow and cumbersome in comparison. Here’s the problem. You may not have both hands available. There is an infinite number of reasons that your support hand may be otherwise occupied. You may be pushing a loved one or child out of the way. You may be fighting off your attacker while trying to draw your gun. You may have a cell phone in your support hand calling for help. You may be trying to get out of a car. You may be trying to get in or out of another door towards safety. Need I go on? Assuming you’ll have two free hands to rack a slide while in a fight for your life is exceptionally optimistic at best. Will you have both hands available to draw your handgun and rack the slide? There are plenty of fine motor skills required to draw and fire a gun as it is. When amped up on adrenaline, and all of that ability to do simple things with hands and fingers goes down the toilet, why would you want to add another manual dexterity step? In the case we’re discussing here, you can see Aceves trying, and failing, to operate his slide after being shot. While hard to tell in the store videos, it’s not clear if he ever succeeded. Ever wonder why ammo manufacturers show capacity of their pistols in terms like 7+1, 10+1, or 15+1? That “+1” references the round that can be carried in the chamber. While we can’t speak for every pistol on the market, the overwhelming majority are designed to be safely carried with a full magazine and a round in the chamber. The loading sequence is straightforward. Fill the magazine all the way. Load it into the pistol and rack the slide, thereby chambering a round. Make sure any relevant safeties are engaged. Remove the magazine and “top it off” with another round to replace the one that was chambered. With limited capacity compact pistols, an extra rounding the chamber is a welcome addition. One extra round doesn’t sound like a lot, but I still haven’t met any gunfight survivors who complained about having too much ammunition left over after a self-defense encounter. To put that in real terms, consider a popular carry pistol like the 9mm Smith & Wesson Shield. The most compact magazine holds seven rounds. If you carry one in the chamber too, you’ll have 14.2% more ammo available to save your life. I’ll take that advantage, thanks. Simply put, modern defensive pistols are designed to be carried with a round in the chamber. Even pistols without manual safeties on the outside have one or more on the inside to prevent inadvertent discharges from drops and the like. While the military recommended carrying the 1911 with an empty chamber back in the day, I don’t know of a single law enforcement agency that does so now. It’s just too risky and even skittish government legal beagles aren’t willing to send their peace-keepers out into the streets at such a distinct disadvantage. The post 5 Reasons Not to Carry a Gun with An Empty Chamber appeared first on OutdoorHub. © 2013 A fire arm. All rights reserved.